Garant Garden Care long handle weeder with 3-sided head to weed different types of areas: larger head design for surface weeding, two-tine side for deeper weeding and one-tine side for hard-to-reach areas. Perfect for weeding flower beds or vegetable gardens and removing weeds between pavers or near walls. 15-year limited warranty on all defects in material or workmanship. Call 1-800-463-7040 for complete warranty details. 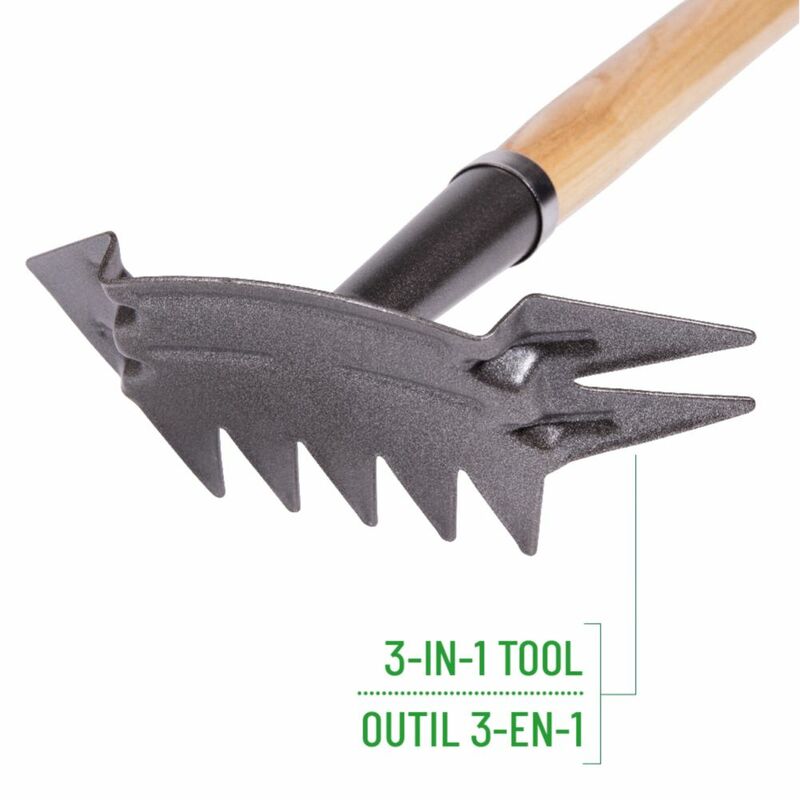 The one piece, cast aluminum Softouch<sup></sup> line, with its excellent weight to strength ratio, makes for a lightweight, sturdy and rust-proof garden tool. The unique over-molded grip is slightly oversized with a large, flat end pad which can be used to generate additional leverage when penetrating the soil. Forked tip cuts deep to get weeds. The grip's shape encourages a neutral wrist position which helps alleviate fatigue. Garden Care Multi-Purpose Weeder, Hardwood Handle Garant Garden Care long handle weeder with 3-sided head to weed different types of areas: larger head design for surface weeding, two-tine side for deeper weeding and one-tine side for hard-to-reach areas. Perfect for weeding flower beds or vegetable gardens and removing weeds between pavers or near walls. Garden Care Multi-Purpose Weeder, Hardwood Handle is rated 1.0 out of 5 by 1. Rated 1 out of 5 by Dave2000 from Multi-surface Weeder Worked great for the first 3 weeds, snapped off at the base on the next one. Poor weld from base to handle. Will be taking it back in 2 pieces now.